The award winning Shandukani project, part of the Hillbrow Health Precinct, is quickly becoming an iconic South African adaptive reuse case study. We are very happy to bring you the Architect's summary of the project as well as some phenomenal before and after photograph. Thank you to Kylie Dixon of Henry Paine & Partners. The project is the result of collaboration between the Department of Heath, The Wits Reproductive Health and HIV Institute (WRHI) and is sponsored by Vodacom (Pty) Ltd, Altech and Altron (Allied Electronics Corporation Limited) with the objective of creating a maternity hospital and research centre from an existing building that was part of the old General Hospital or 'Hillbrow Hospital' as it was known. The area is now known as the Hillbrow Health Precinct. We, as the architects, were asked to adapt the old operating theatre and x-ray building into prenatal and antenatal facilities that will be operated by the Department of Health as well as a research centre that is to be run by WRHI. We were asked to design "a 'happy place' with unintimidating materials, finishes and furnishings; that it should be more like a living room than a hospital". The spaces were to be designed to be comfortable for mothers and children as well as for the staff who were to occupy it. The well-known architect Gordon Leith designed many of the buildings of what is, arguably, the best collection of conservation worthy buildings in Johannesburg, making up the Hillbrow Health Precinct. 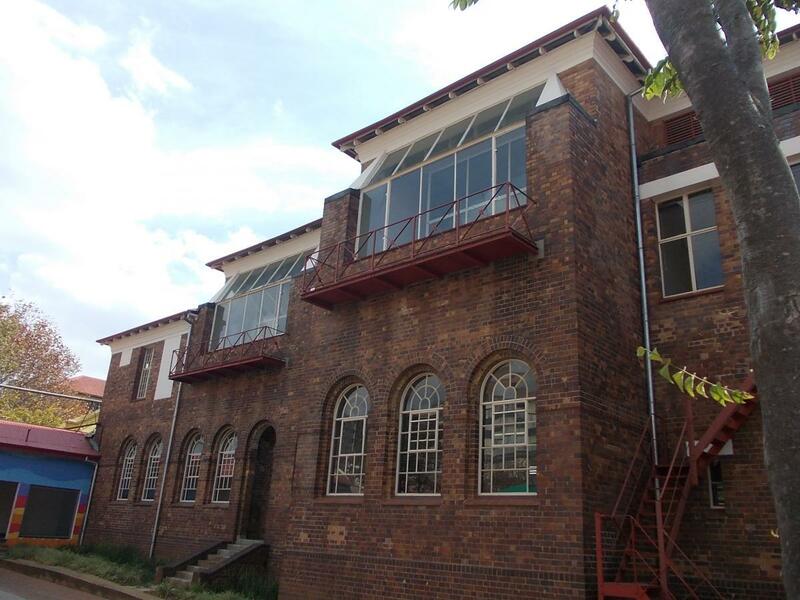 Leith designed the van Niekerk Building in 1927 and it was this building that was selected by our client to be adapted. The two- story load bearing brick building was opened in 1928 as "one of the most advanced operating theatre facilities in the Union". The building was adapted in terms of the maxim of doing 'as much as necessary and as little as possible to the building'. As the building had been abandoned for many years it had become severely damaged and waterlogged resulting in the need for a complete overhaul which necessitated an extensive re-fit of services as well as the addition of new services required by modern medicine. The building was not large enough to accommodate all the needs of the new facility and it was necessary to add a third floor over a conveniently located flat roofed area on the north side of the building. It is possible that an extension over this area was envisaged by Leith in 1927. As heritage practitioners, it was clear to us that a comparatively lightweight structure would be needed to form new accommodation on the existing flat roof. The new structure had to have a minimal impact on the original structure and it had to be possible to remove it and return the building to its original configuration, if this should be required in the future. The ability to return a building to an earlier/original period is an important heritage principle. The structure had to be quickly and easily erected in a densely packed precinct surrounded by buildings already occupied. The conservation related reason of adding to the building in a way that clearly differentiated 'new' from 'old' reinforced the rationale. The floor area of the new third floor was required to be larger than the existing roof necessitating a cantilevered extension over the north façade.Steel was the only structural material that the architects felt had the characteristics required. The aesthetic of the building is entirely determined by needs and by the natural characteristics of the materials. The new structure was intended to contrast with the original brick building and to provide sun protection to the floor below. The lightweight steel roof was insulated and overhangs the windows to give protection from the summer sun. A lightweight grille also provides privacy from an existing building to the north and supplements protection from sun and glare. The building is not air-conditioned, a decision taken from the point of view of sustainability as well as for medical reasons. Infection (TB) control requires maximum natural ventilation and a continuous supply of fresh air (not recycled air as is the case with air-conditioning); the client expressed a strong preference for natural ventilation through opening windows to create pleasant working environments. The new steel framed part of the building has been designed with sun protection and insulation that will make air-conditioning unnecessary; the old parts of the building were designed by Gordon Leith to be cool in summer. Ventilation and heating (when winter temperatures make it necessary) is provided by a system that allows for adjustment of volume and temperature. Environmental concerns were paramount in the design of the building. 80% of the new steel structure can be recycled and the entire old structure has been re-cycled in ways that are sustainable. Should circumstances change at some point in the future, the use of steel makes it possible to dismantle the structure, re-use it, and to leave the building in its original state. Considering the issues of re-cycling and those of climate control with minimal use of new materials, it would be very difficult to design a building with a smaller carbon footprint that the Shandukani Centre, as it is known.